DC Superheroines Thunder and Lightning are the focus of a new series of short animated episodes airing on DC Nation’s Saturday animated shorts. 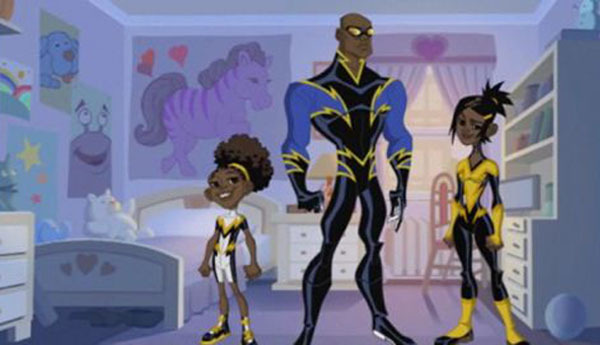 The short mini-episodes center around classic DC superhero Black Lightning and his two daughters Thunder and Lightning. Highlighting the daily details of family living, like sick days and sibling rivalry, the series is more like a family sitcom than a typical superhero action series. So far, only two shorts have aired, but we’re hoping for more! And maybe, with enough of a following, it could even get turned into a full-on series… It’s about time we got a Black family superhero sitcom on TV! The shorts air on Cartoon Network, during DC Nation’s block at 10/9c.